Hypoplectrus liberte, filmed by Kenneth W. Marks Victor, B.C. & Marks, K.W. (2018) Hypoplectrus liberte, a new and endangered microendemic hamlet from Haiti (Teleostei: Serranidae). Journal of the Ocean Science Foundation, 31, 8-17. 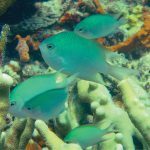 The Hypoplectrus hamlets have long been one of the great evolutionary puzzles among coral reef fishes. These small seabasses are highly diverse in their coloration, varying from bright yellow to blue to black and those that are prominently barred, with just as many intermediates phenotypes that blur the edges of where one form stops and another starts. Morphological and genetic data hasn’t always been helpful for discerning these differences either, and so, historically, the number of species recognized in this genus has been contentious. Earlier researchers hypothesized that the bewildering diversity of forms found in this group was really just representative of a single highly diverse species, but this view has long since fallen out of favor. Decades of extensive research into the breeding behaviors and genetics of Hypoplectrus has revealed that the various color morphs are in fact acting as one might expect of different “species”. The early 2010’s saw a rash of new taxa described. H. maya and H. randallorum in 2011, H. castroaguirrei, H. ecosur, and H. floridae in 2012, and H. atlahua in 2013. What each of these had in common was a relatively limited distribution, indicating a level of allopatric speciation not often seen among Atlantic fishes. 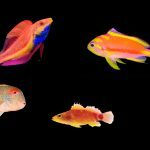 And now there’s an exciting new entry to this group… a hamlet featuring a surprisingly distinctive appearance and which may very well be one of the rarest coral reef fishes on the planet. 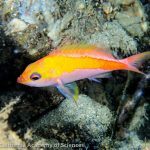 The Liberte Hamlet was discovered as part of a survey investigating the biodiversity along Haiti’s northern coastline, in a region recently designated as the Three Bays National Park. Fort-Liberté Bay is a small, turbid body of water connected to the Caribbean by a narrow channel, naturally limiting the connectivity of the marinelife here from populations outside the bay. And it’s under these isolating conditions that Hypoplectrus liberte is thought to have speciated. There’s no mistaking the Liberte Hamlet, as, out of the 19 species now recognized within this genus, it is the only one with a striped (versus vertically barred) patterning. The bold markings of H. liberte are suggested to be an adaptation to the turbidity of these reefs, similar to those found in H. floridae and H. ecosur, both also from heavily turbid waters. But unlike with those taxa, which were found to have a significant genetic distinction from hamlets elsewhere in the Caribbean, this new species isn’t so easily discernible. The CO1 gene, relied upon for distinguishing between closely related species, showed no apparent distinction between H. liberte and the other hamlets in the region. For some taxonomists, this might argue for this readily recognizable color morph being nothing more than a variety of these other “species”. It’s apparent closest relative is no doubt the Barred Hamlet (H. puella), with which it shares evidence of a vertically barred patterning set against a lightly colored body. The surveys of Fort-Liberté Bay found both of these fishes to be present (visible in the video), though H. puella was reported to be far less-common within the bay. Also present were the Shy Hamlet (H. guttavarius), the Indigo Hamlet (H. indigo), the Black Hamlet (H. nigricans), and the Butter Hamlet (Butter Hamlet). With such a small distribution, the total population of the Liberte Hamlet is estimated at just a few hundred or thousand individuals. 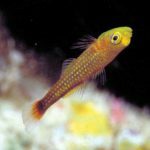 For a reef fish, this is a startlingly small number and likely makes this one of the single rarest reef fishes known to science. While it is presently quite common within this bay, any damage or shift in the local ecosystems could easily drive this fish towards extinction. 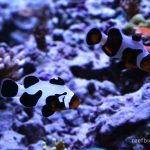 Assuming Hypoplectrus liberte is truly a valid species—always a contentious subject when it comes to hamlets—it would be hard to argue that this fish isn’t already critically endangered. Hypoplectrus liberte, , filmed by Kenneth W. Marks. Victor, B.C. & Marks, K.W. (2018) Hypoplectrus liberte, a new and endangered microendemic hamlet from Haiti (Teleostei: Serranidae). Journal of the Ocean Science Foundation, 31, 8-17. Victor, B.C. & Marks, K.W. (2018) Hypoplectrus liberte, a new and endangered microendemic hamlet from Haiti (Teleostei: Serranidae). Journal of the Ocean Science Foundation, 31, 8–17.